I enter Nandana through a 8-foot-high, 12-foot-wide 250-year-old hand-carved teak doors. They were salvaged from a Javanese temple. Inside, the teak floors are from Myanmar and feel soft underfoot, and strangely soothing. I’m told a lion statue in the main hails from India. I’m beginning to lose sight of where I hail from. Am I really standing just 65 miles from South Florida? My eyes are telling my brain it should feel jet-lagged. 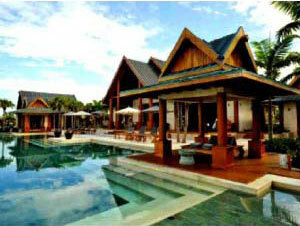 There are six Thai-inspired beach pavilions. Asian temple reliefs dot the landscape of 300 varieties of imported palms. Everywhere I step, Nanadana’s architecture art and decor from Vietnam, Indonesia, Cambodia and beyond tan-send my notions of a Caribbean escape. Four stand-alone master-suite. 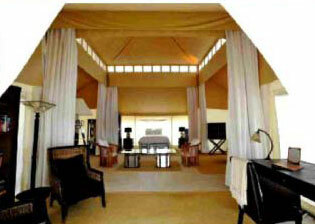 The fifth a luxury safari tent is a replica of a resort in India. That figures. What doesn’t? Finding a immersive, faraway experience like this minus the jet lag.